First of all I’m assuming you understand a whole tone? Basically, from C to D, D to E and so on. So what do I mean by jumping over the desired note? Well, lets look at the example audio and use this to better explain. 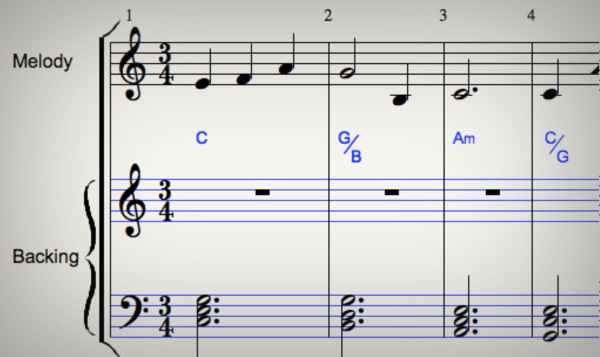 In step 2 of the previous example, we decided that the featured melody note in the second bar would be G. What we can do now, is plan ahead a little in bar 1. As we are playing the notes working up toward the G… we first jump over the G note by a whole tone, to play an A first, before finally landing on the desired G in bar 2. In other words, we’re avoiding the natural instinct of simply to travelling up the scale from E to G, by jumping over the G note by a whole tone first to play a A, and then finally completing the sound by settling on the featured note of the G in bar 2. Remember, if we were playing a melody where the notes were travelling down the scale, we’d jump down over the desired note first before finally going back up to that note. This technique involves you planning ahead a little, but, once mastered is a very effective way to add some interest to a melody line. The next step again utilises the ‘jumping’ technique between notes, but this time by six notes of the scale! Another tip great tip for spicing up your melody is to jump six notes of the scale, either up or down the scale. This rather large jump between notes can be extremely effective when used at the right moment in a melodic phrase. 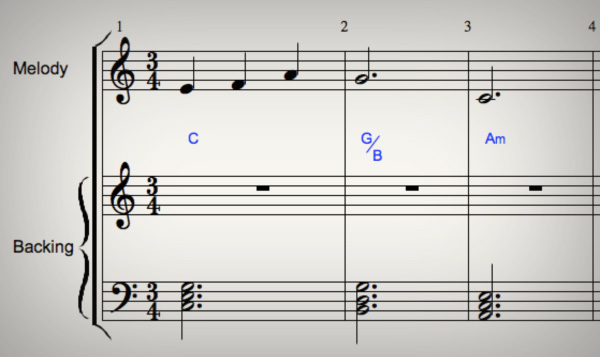 If we continue with the melody from the previous example, one place we could include a six note jump is after the G in the second bar. We jump from the G down the B (from G, we hop over F, E, D, C, and fall on B) before finally moving in bar three and playing the C note. I hope you notice how this six note jump really adds something special to the melody, and indeed now, with these three bars alone, we have the start of a very beautiful and rather memorable melody line. We can use the same technique to continue the melody with another six note jump, this time perhaps going up the scale, from the C note that we finished on in bar 4 to an A (at the start of bar 5). We know that this will sound good, because the A note we’re going to jump to is part of the F Major triad – which is the chord being played at the time we fall on the featured A note! Here’s how this would look and sound as I’ve then continued in to bars 5, 6, 7, and 8.